This narrow gauge engine was spotted in North Wales just asking to be painted, with all those lovely rusty colours. I decided to use artists' coloured pencils, mainly Faber Castell Polychromos with a few others, on textured watercolour paper to convey the rough and rusty texture of the engine. Also this medium also brings out all the sublty of colours which were a joy to capture. The greenish foliage behind helps enhance the range of reds, browns and purples. 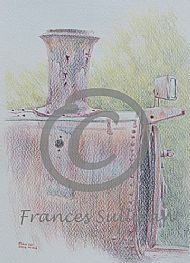 A very beautifully drawn rusting narrow gauge engine.